Have you ever seen the South Park episode “Smug Alert,” in which the whole town of South Park buys hybrid cars? Despite the car’s zero emissions, the hybrid owners are so smug about their cars, they end up spewing out tons of emissions in the form of “self-satisfied garbage” which rivals that of San Francisco. This seems to be the general consensus of non-hybrid owners. Hybrid owners are cocky, smug, and slow drivers that think they’re better than everyone else on the road – I’ve heard it a hundred times. Here’s the thing – in the past, there’s always been some truth to that. The original Honda Insight and Toyota Prius were too small, too unlike “regular cars,” had little versatility, and didn’t get fuel economy that was any better than driving a small diesel-powered car economically. Celebrities and many others bought the car for the trendy green image, so it looked like they cared about the environment, and this is where the smug-factor began. As Toyota and Honda are making their hybrids better, however, this image may start to dissipate. Why you ask? Because as the hybrids get better, they become more like your regular cars. Other than the overall lack of power, there is no longer a sacrifice to buying a hybrid – they will have just as much room (or more) than their gasoline-only counterparts, the transition between electric and gas engine becomes less noticeable, and their everyday drivability will rival that of a gas-powered car. In short, they’re becoming more like the cars that we’re accustomed to, and less about the image. 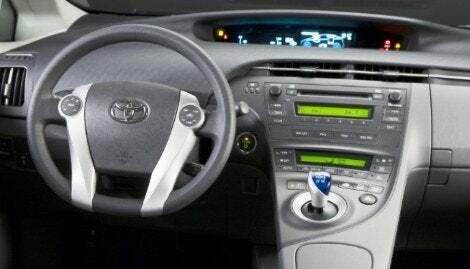 Does the all-new 2010 Toyota Prius accomplish this? Toyota worked hard on making the new Prius better in every way. We drive the new Prius for a week to find out. On the outside, it’s still noticeably a Toyota Prius. Some styling has been reworked to keep it fresh, but the body style is more about function (aerodynamics) than appearance, which is why the Honda Insight looks very similar as well. This 3rd Generation Prius, in fact, has to lowest Cd (aerodynamic drag) out of any mass-produced car in the world. The interior has also been reworked, offering more logical placement of buttons and controls on the center floating console, which has a storage area underneath. The driver and front seat passenger now have more room at no expense of rear seat legroom thanks to a new front seat design. Toyota also added driver height adjustment to the seat; an underrated feature that woos those taller or shorter than average. 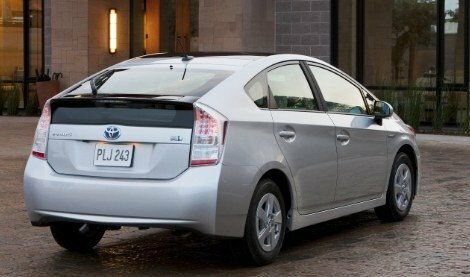 The 2010 Toyota Prius gets more power and fuel economy, too. A new 1.8-liter 4-cylinder gas engine and two electric motors (one for propulsion and one for powering the electrical systems) help the 2010 Prius achieve a power output of 134 hp. EPA fuel economy ratings are 51 mpg city/48 mpg highway, which is the best fuel economy out of any production car on the market. The impressive part is you can do better than that. Despite my sometimes aggressive driving, I achieved an average 54 mpg with mostly city miles. The 2009 VW Jetta TDI we had could once achieve hybrid-level fuel economy (46 mpg average.) While still impressive, the Prius tops it by a hair. The only available transmission in the 2010 Prius is the CVT, which works well on this car. Driving is now surprisingly like a regular car. The transition between full-electric and gasoline engine power is almost unnoticeable. The versatility and cargo room rivals that of mid-size sedans, and while power is still lacking, it’s noticeably better than last year. The strange shifter lever still takes some getting used to, but relocating it to the center console (from the dash) makes more sense. The new driving mode selector gives you the choice of Normal, EV, Eco, and Power modes. Strangely, I got more fuel economy in normal mode than Eco, probably a result of Eco mode’s lack of throttle sensitivity, which required me to push harder for the same acceleration. EV mode is very picky and depends on speed, battery charge, and apparently how warmed up the car is. EV mode disables the gas engine completely, allowing you to travel up to 25 mph (or 10, depending on its mood) for a short time period on electric power only. This is useful for parking lots, rush-hour traffic, etc. 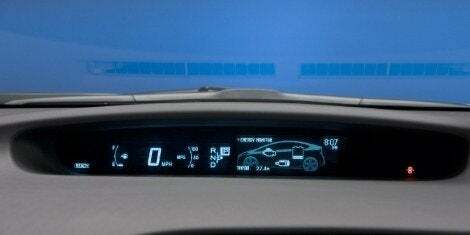 The new LCD instrument cluster display is nifty, allowing you to choose between multiple screens to monitor your efficiency stats including real-time graphs, a model showing power distribution, and a Hybrid System Monitor displaying battery status, trip information and MPG, and a status bar showing your efficiency level. I kept it on this screen most often to monitor my by-the-second efficiency, but noticed that I kept my eyes on the screen more than the road, making sure I’m still in the “Eco” section, or trying not to engage the gas engine during acceleration for example. Not a good idea. There isn’t too much to complain about on the 2010 Toyota Prius. It’s far from exciting to drive; a downright bore, honestly, but it’s not supposed to be exciting. It’s a big step up from the previous generation Prius, which should entice plenty of buyers who were considering picking one up. Significantly better fuel economy, more power, more cargo room and versatility, better looks inside and out, and more features should give Prius owners reason to upgrade, and car shoppers another model to consider. 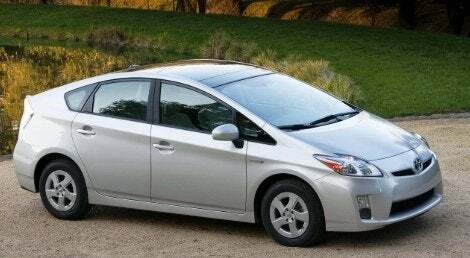 The 2010 Prius is now an acceptable everyday replacement for a mid-size sedan. Despite the refinements, however, the “Prius driver” image is still an issue. They’re still seen as cocky and pretentious – something I’m afraid won’t go away any time soon. No Comments on "2010 Toyota Prius Review"